Delete unnecessary Checks. 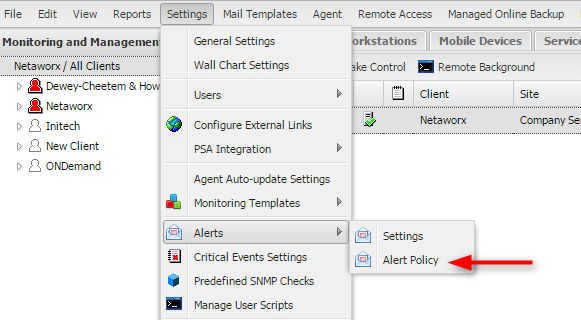 When an agent is installed on a Server or Workstation, On installation it builds check for all relevant services. By default, Microsoft has its own Anti-Virus and Anti-Malware services monitoring for the presence of third party anti-virus: therefore, checks are built for these services. After you deploy Managed Anti-virus, these checks need to be deleted. (Right click on the check and select “Delete Checks Like This” to delete checks on more than one computer at a time.) Be sure to delete any other unnecessary checks like Drives that can’t be found and so forth. When you first install MAX RemoteManagement on a server, you may notice a high amount of performance monitoring alerts on your servers. This may seem daunting at first, but you can quickly get these alerts under control. 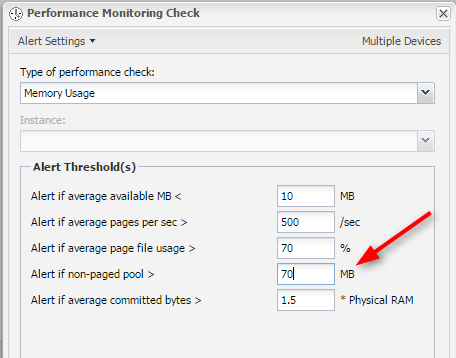 First thing to note is that you are not necessarily monitoring for performance. Nearly every server has different hardware and usage of its resources; therefore, you are monitoring for variation in the behavior of the server not its performance. If a server has been using an average of 10% of its processor and suddenly it jumps to 20%, you would still want to know what changed, even though 20% is far beneath the optimum processor usage. Start by clicking on the “More Information” link next to the failed check. 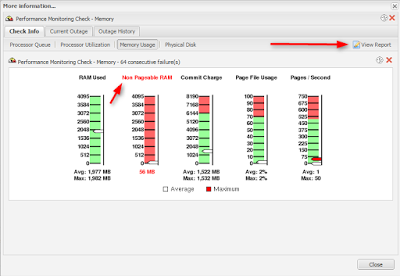 Notice that the Non Paged Memory is red. This is telling you that this is where the check failure is. At this point you want to get a baseline of the Non Paged Memory in order to set your threshold. Notice there is a “View Report” button up in the right hand corner of the window. This is where you go to obtain that baseline. If the Green Line goes above the Red Line, the check will fail. So in this case 70 MB would be an appropriate threshold.